Honestly when I saw this picture. I wasn’t sure how to feel. I would have laughed if it wasn’t so sad. The sad part is some girls are this demented. They actually will go back and beg the cheating, woman-beater to take them back. OMG! “I don’t know if I can forgive you” u know, Kai na real wa, that he cheats is bad enough and then an additional degree of woman beating..
Mescheewww both of them are not serious. Should he forgive her indeed.. He’s a clown! She’s pathetic n desperately looking for “love”. I’ve never been able to wrap my mind around girls who hang on to cheating woman_beaters either. Its not his fault. 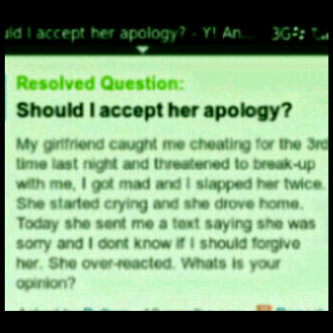 If she didn’t text to apologise,he won’t be asking himself this silly question. Hmmm, who should beg who now? Oh girl u better cut off this guy and hold God. God can give u the son of a King. Are you NOT kiddin me right now? Did I miss d line where she slapped him right back, a triple whammy ds time, drove off with his car and ran it into a ditch? Shioooooooo! As in, arrant nonsence! You see, God speaks nd directs us always but bcos of this lust of a thing, we endanger our lives nd destiny to someone who is not worth it. You, the man needs forgiveness not only from her but also from God. Go change ur ways. As for the lady, go and fall in love with God first knowing what He desires nd expects from you, then ur relationship with man will have meaning. Life is soooo beautiful, only in Christ. O GA OOOO. lol at “grace for suffering hahahaha PM you are funny oooo.